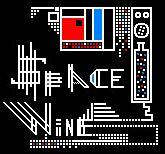 SpaceWine is an electronic musical experiment, which branches out into other art-forms. We like funk, energy and beats. We like musical ideas and interesting sounds. We like rock, drum 'n' bass, metal and psychadelia. We use synthesizers, guitars, keyboards and drum machines. Groove-circuits, science fiction, fourth-dimensional living energy. We like to create, and we are compelled by the dionysian spirit to create without reward. We also make visual art.